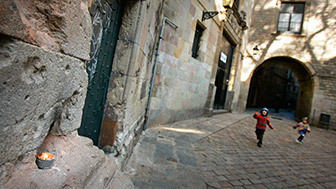 Old Barcelona's medieval and rural origins surface surprisingly in the middle of the new city. Tucked away in Carrer de Pere d'Artés, a small street in Nou Barris, Santa Eulàlia de Vilapicina, with its sanctuary and two farmhouses, is a fragment of history that invites you to take a fascinating journey to the place where the district originated. 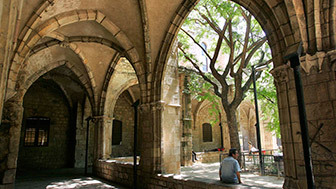 Santa Eulàlia de Vilapicina was an old hamlet dating from the 10th or 11th century that later belonged to the independent municipality of Sant Andreu, before it was annexed by Barcelona at the end of the 19th century.Today it is part of the Nou Barris district and, despite the passage of time, it still preserves vestiges of that past as a rural hamlet built around a church that is still standing today. The old street Carrer de Pere d'Artés runs through this thousand-year-old set of buildings, which still survive after so many years.In the middle of them is the Church of Santa Eulàlia de Vilapicina, which was built on the remains of an earlier Romanesque church in 1782, preserving its chapel and some of its outer walls. The old Vilapicina road that used to link Sant Andreu with Horta was also respected and a bridge was built to link Vilapicina with Can Basté,one of the other buildings that can still be seen in this old centre today. The 17th-century farmhouse, which belonged to some tenant farmers, was renovated several times in the course of its history, until it became the property of the City Council in 1980 and was turned into the Can Basté civic centre. 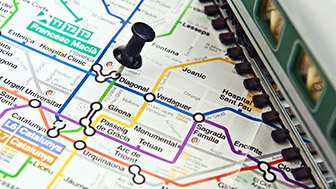 Another civic centre can be found at Torre Llobeta. This 15th-century mansion is one of the most remarkable farms on the Barcelona plain. The historical centre of Vilapicina also includes the Ca n’Artés farmhouse,which was a travellers' inn during the 14th and 15th centuries, owned by the monk and art enthusiast Pere d’Artés.Today the house is in a perilous state but it still preserves some original medieval features, such as the door with a round arch in the middle of the facade and one of the windows with a pointed arch. A stroll through this piece of history in the present-day district of Nou Barris, contemplating the rural remains of places that no longer exist, encourages you to travel back to a distant past that still survives today.